A Caribbean Mystery is part of Miss Marple series by Agatha Christie. The author has written so many amazing books that she is an inspiration for many authors. Her simplicity, knack of weaving crime mysteries and writing style has won many hearts. Amazingly, I never read any Agatha Christie books. I randomly picked it up because I liked the setting of the book – amazing Caribbean island known for its peaceful atmosphere and scenic beach beauty… I just couldn’t resist. 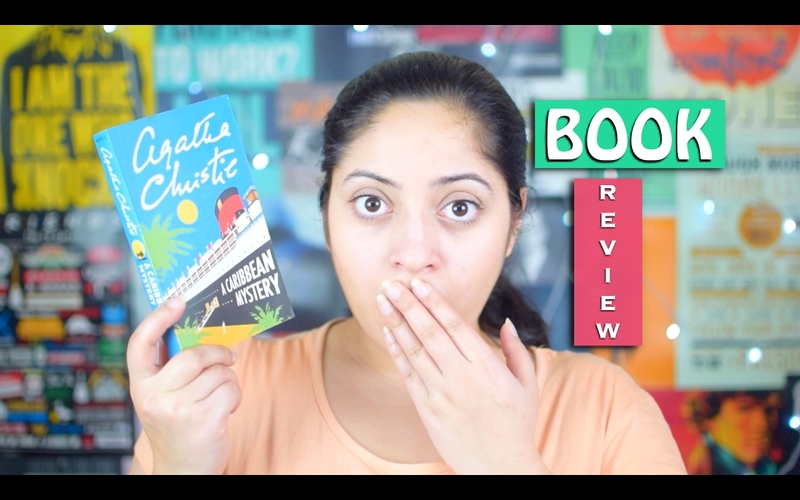 In my usual format of review, I am going to review A Caribbean Mystery today by analyzing the plot, writing style and characters of the book without giving away any spoilers. Shall we start? The story is set on a beautiful Caribbean island, where miss Marple is holidaying and chit-chatting with other vacationers. One such conversation takes a curious turn when an old man tries to tell her about a murderer. Alas! Miss Marple’s curiosity was tested for the conversation never ended, but the life of the old man did. Miss Marple suspects that the old man was killed by the murderer or his/her well-wisher. She also believes it must be someone who overheard that conversation between Miss Marple and the old man. She is going to put the detective cap on now and go find out the truth. It’s a very simple plot. The thing about murder mystery novels is everybody tries to guess who’s the murderer. We try to analyze everything as the hint and act as a detective ourselves. If you’re a person like that, you may get disappointed. See… I couldn’t guess who was the murderer. In fact, I found it pretty fascinating and unpredictable. But that was me who never tries to even solve a beginner level puzzle. Any person who is used to reading such murder mystery novels and likes to do the digging will be able to guess the outcome easily. So, if you’re unlike me and think you’re good at judging mysteries, you may not thoroughly enjoy A Caribbean Mystery by Agatha Christie. Having said that, I still feel the plot was enjoyable to the extent that I would recommend it to a beginner level reader or anybody who wants to start reading books in this genre. The book is a short one. so, don’t expect detailed descriptions about the characters. However, I loved the attention that was given to each character. Everybody in the book was a suspect for Miss Marple and she doesn’t lose focus on any of them. She truly analyses everybody through a fair lens and that makes the entire book a very beautiful read. I also loved how the author wasn’t hell bent on focusing on Miss Marple and gave fair attention to every character. She is the queen of mystery novels. With so many books published and re-published, her name is truly unforgettable in the reading world. It has a lot to do with her writing style which will be loved by beginner and expert readers altogether. I don’t call myself an expert reader but I have seen people, reading complex mystery novels and authors like Dan Brown, Sidney Sheldon and all the elites in the genres, recommending this author to many. That truly proves how her beautiful writing strikes a chord. Overall, the book is a great and quick read. The writing and the story flow like a calm yet fast river and gives you plenty of pleasure of reading. It’s an entertaining read I would definitely recommend to readers who like simple and short crime mysteries. Previous articleWhat I Learned By Gymming Regularly For A Week? How Audible Works in India? I love reading books. I had read “And then there were none” by agatha very long back and enjoyed it. I guess I should read the caribbean mystery too.